dark moments was your heart's resilience. As we give to ourselves the same amount of love we give to others, we give ourselves the gift of living up to our full potential. As we give to ourselves the same amount of respect we give to others, we give ourselves the chance to step into our truest identity. The root of self-love begins in the heart. The ability to love ourselves regardless of what we consider to be our flaws or shortcomings is the first step to turn self-hatred into self-compassion. Loving ourselves is not the same as being narcissistic. Loving ourselves comes from being kind and loving to ourselves, whereas narcissism comes from covering up our insecurities with false displays of confidence. Loving ourselves is also not about ignoring aspects of ourselves that we don't like. It's about quietening down that negative inner critic and replacing it with more compassionate self-beliefs that can help us see ourselves in a more loving light. From there, we can begin to look at ourselves from a more loving perspective and stop being too hard on ourselves. Think about those we care about and how we treat them and start treating ourselves in the same way. Talk to ourselves the way we would talk to a good friend. Ask ourselves, "What would I say to a good friend who was going through the same thing I am going through?". Start embracing the concept of 'good enough' rather than striving for perfection all of the time. The quest for excellence shouldn't jeopardize our sense of security and well-being. Give ourselves the gift of space. The space to be more attentive to ourselves. The space to grow beyond our old limitations. The space to love ourselves unconditionally where we feel more open to accept ourselves just the way we are. Happy New Moon! The Moon is joining the Sun, Jupiter and Mercury Rx in Virgo, marking a super intuitive and illuminating New Moon in the sign of the Virgin. Seeing from a higher perspective is what we need now to understand our circumstances from a neutral vantage point. Instead of only considering ourselves, try to consider what we need to understand the people and environment we're currently engaged in. Other points of view are needed before we can move forward. There's a big world out there - filled with a multitude of potential. The New Moon in Virgo is guiding us to widen our scope and see beyond the small 'self'. The Moon is forming a square to Saturn and Mars in Sagittarius, and fear is leading the way into places we don't need to go. Facing the unknown is the only choice we have right now if we truly want progress. It's okay to be afraid, but that shouldn't stop us from taking a leap of faith. Listen to our heart and soul as we are called to express our true selves. It's time to come to the edge and discover that we can fly. But first we must step into the unfamiliar in order to find our miracles. The Moon is also forming an opposition to Neptune Rx and Chiron Rx in Pisces, bringing to us the opportunity to co-create our reality with the magick of self-love. We are creating our reality every moment of every day with our feelings, thoughts, beliefs and actions. Instead of letting self-hate lead the way, let self-love be the paintbrush that co-creates a beautiful, unique expression of our soul. Be a manifestor of dreams by reveling in the power of our will and inspiration. Reclaim our partnership with Spirit and get out of our own way. With the Moon's trine to Pluto Rx in Capricorn, we are setting new standards and boundaries which are more in alignment with our true values. It's human nature to yearn for certainty and resist change, yet one thing guaranteed now is change. As we are guided to shift directions, we will embrace ourselves more fully with renewed clarity and strength. The Virgo New Moon, which also happens to be a Solar Eclipse, brings a time of butterfly-like transformation. It's about time we recognized that we did our best with what we understood back then. It's about time we appreciated the lessons we've learned from our choices. It's about time we asked ourselves, "How can I love myself more? ", "How can I forgive myself and accept myself more fully? ", "How can I build a stronger foundation within me with the new awareness, knowledge and understanding that I have now?". and dig in a little deeper to unlock your true potential. Within our empowered self lies our true potential. The potential to grow. The potential to see from a more liberated point of view. The potential to break free from old shackles of disempowerment and live authentically from the soul. Some have been wearing a mask of their idealized self for a long time that they forget where their true self resides. The mask of an idealized self is a mask we wear to hide negative beliefs we have about ourselves. These negative self-beliefs may seem like our true identity, when in truth, they are only our ego's attempt to separate us from love. And without knowing it, we attach ourselves to fear and begin questioning our self worth. Know that in essence, we are all multifaceted and complex, and finding our sense of empowerment doesn't mean neglecting our core pain and false self altogether. It means that by getting in touch with what motivates us to embody our core power, we also become aware of the beliefs that drive our core wound. From there, we are able to locate where our pain is located within us, and find a way to strengthen our ability to rise above false self-beliefs. As we gradually release our sense of disempowerment, we open the door to wisdom greater than what is available in the limitations of human experience. This is where our true power lies. The power to listen to the oracle within. The power to navigate our journeys by accessing our inner guidance. The power of deep knowing and trusting our vibes. No matter what's going on around us, we stay true to ourselves and stick to our gut. It's time to say "no, thank you" to anyone in our life who exhausts us and say "yes please!" to everything that strengthens our spirit and liberates our soul. Happy Full Moon! 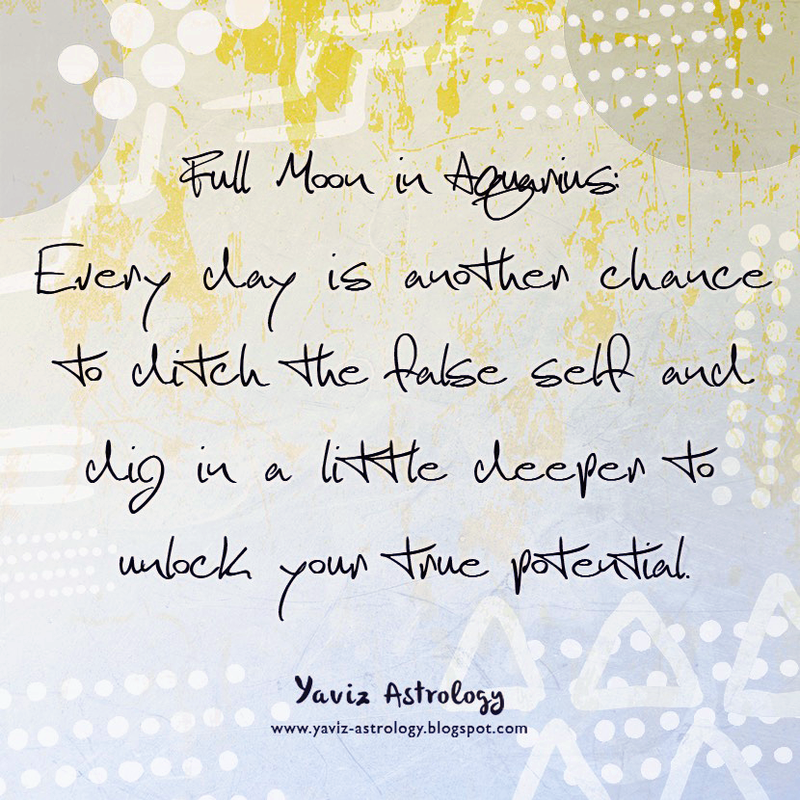 The Moon is in Aquarius forming an opposition the Sun in Leo, marking a Full Moon in the sign of the Water Bearer. A complete resolution is on the way, as long as we're open to the idea of evolution. Evolution is a gradual process of growth. A willingness to evolve. An openness to change. This is a good time to look in the mirror and ask ourselves, "Who am I? ", "Am I truly the kind of person I believe I am? ", "How can I evolve and become the kind of person I want to be?". The idea of liberating ourselves from past limitations can be especially appealing to us now. We want to be more open, more authentic, more ourselves. We can see that our unique qualities are not something to be ashamed of, but something to be cherished. There is great power in understanding our own story now. Realizing that the story we tell ourselves define the nature of our experiences. We may not always know why we do the things we do, because our feelings are not always logical. But now is the time to recognize whether we are being triggered by old, outdated beliefs we have about ourselves or unresolved issues from the past. Listen closely to the messages from our intuition. What does it tell us about ourselves and others? Aquarians like to find ways to revolutionize old ideas and bring them into the future for the greater good. Whether through creating social groups and connecting with like-minded individuals on the internet, or through expressing their unique talents in a way that can benefit the human race as a whole. Be extra clear now about why we want the things we do. Are we driven by a desire to serve? Or are we sharing our talents because we simply want to be admired? The Moon is forming a sextile to Mars and Saturn in Sagittarius, and our drive to move forward is back. Keep going in the direction of our hopes, dreams, or plans. It's important that we stand our ground and believe in ourselves. Do not let other people intimidate us into quitting. Just because they don't have our vision doesn't mean we shouldn't follow our heart. What we need now is faith. Stay positive and visualize the outcome we're hoping for. Let go of negativity or pessimism and choose a more sunny outlook where we have more faith in ourselves and our cherished dreams. Mars and Saturn joining hands calls for us to take matters into our own hands. And to remember that setting boundaries with those around us to create a safe and secure environment is nothing to apologize for. With the Moon's sextile to Uranus Rx in Aries, it's about time we made a conscious choice to be the person we are meant to be. We know that there is something more out in the world for us when we embody our truest self. Uranus in a retrograde phase is guiding us to let our inner truth talk and urging us to leave toxic situations behind. Or at least distance ourselves temporarily so that we can regain our center. Sometimes all we need is a time to rest, recover and heal from all our experiences. Give our mind a chance to heal from harsh energy and intensity. We have the ability to walk away from anyone or anything that's triggering emotional pain. And as we walk away, we will gain insights into what we will and won't accept in the future. It's a time of self-discovery and resurgence of energy. A time of admitting the truth to ourselves. A time of following our dream into fruition. A time to affirm: Yeah! LET'S DO THIS. were moments of power, wisdom and revelation. Sometimes, choosing peace over drama is not about being weak or cowardly, but about being mature enough to see that there's more to life than ego battles and fruitless spectacle. There comes a time in life when we are able to see things from a higher perspective, to broaden our horizons and to see the big picture. Petty grievances and peevish arguments become trivial as we see that they are merely attempts to satisfy the negative ego. Our ego becomes a negative influence in our lives when we fear its dissolution. So we defend it, in any way we can, attracting more people who can keep fueling it and making us avoid anyone who might cause it to be teared down. The negative ego is based on lack and fear, and it is fueled by our attachment to reasons to be unhappy. The only way towards freedom is to recognize its influence in our mind and to find ways to dissolve it. Dissolving the negative ego requires patience and takes some practice, because it's not so easy to see our true higher self when we are under its influence. Our true empowered self that lies beneath the facade of disempowerment. Our true loving nature that recognizes love in its truest form, which can only come from the soul. Herein lies our power. The power to be a peaceful warrior. The wisdom to see that we are not our negative ego. The revelation that as we release our attachment to negative self-beliefs which drives us to proclaim a sense of unworthiness, we clear the way toward finding a growing sense of inner stability and outer flexibility. Happy New Moon! 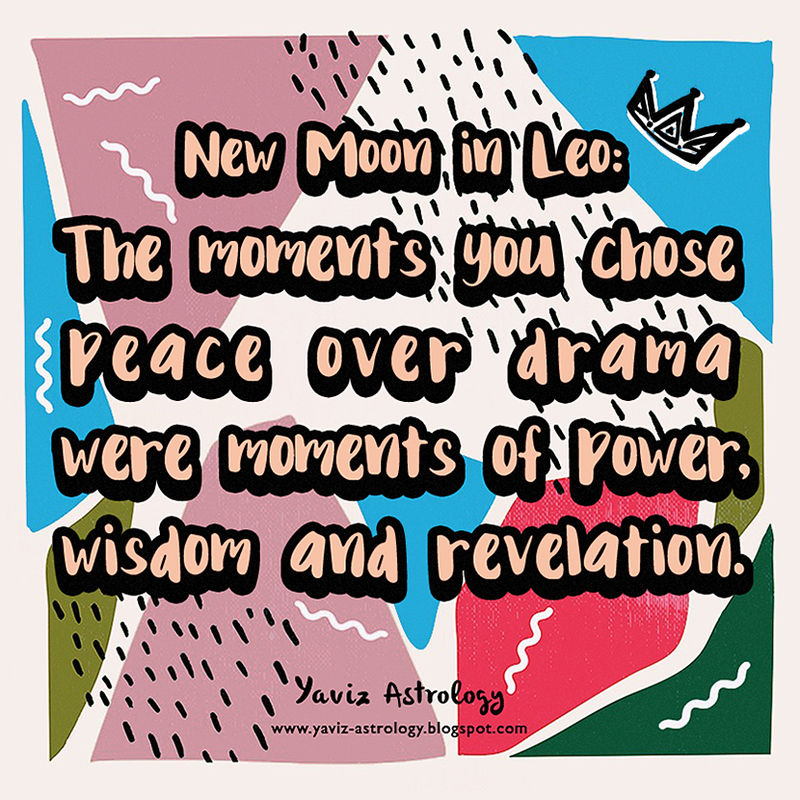 The Moon is joining the Sun and Venus in Leo, marking an especially heartfelt New Moon in the sign of the Lion. As a ruler of Leo, the Sun truly feels at home in this sign. With Venus the love planet also moving through the sign, we wear our heart on our sleeve. Even if we are not the emotional type, we can find a closer connection with our emotional world. What do we really want? What do we really wish to let go? Whatever it is we may want to accomplish, love is the healing energy that we need right now. The more that we allow our heart to be filled with love, the less room there is for fear to enter our consciousness. This is not to protect ourselves from the so-called real world, but to not allow fear energy to pull us down. There is a difference between the two. One is about living in denial, while the other is about embodying our truest self, which is a conduit for love energy. 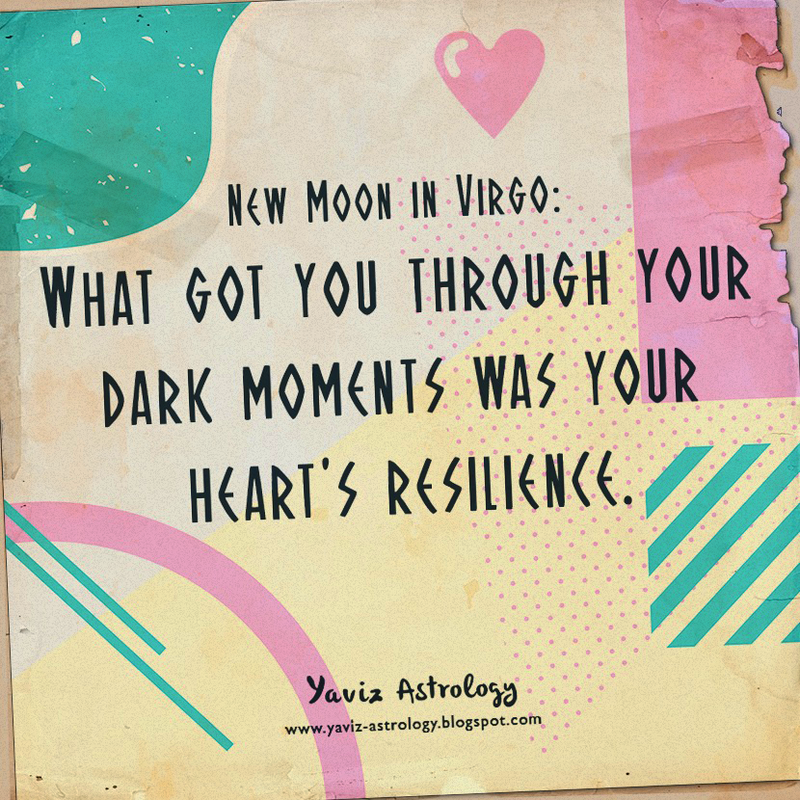 A New Moon in Leo brings an opportunity to begin from the heart again. To live a more heart-centered life where we feel more at one with our truest self-expression and creativity. This is about moving beyond old fears or perceived limitations and going bigger and bolder through genuine inspiration. This is about joyfully expressing ourselves without fears of judgment and failure. Because this is not about winning or losing, but more about being true to ourselves. Find happiness in the present moment, whatever is happening, and feel the liberation that comes from embracing our true spirit. Being happy and lighthearted can be a wonderful icebreaker now. With the Moon's trine to Saturn, we are reminded that we deserve happiness as much as everybody else. Perhaps we don't feel deserving of happiness, unless everyone else around us is happy. It's time to get in touch with any guilt that pushes us to believe that we can only be happy when we have something (or someone) that we desire. Or perhaps we also hold the belief that being happy means letting go of responsibilities, which in some cases, can lead to unwanted consequences. Know that we always have within us the ability to rise above negative thinking and drama. This doesn't mean that we shouldn't care, or that we won't take positive action. By rising above self-pity, blame, resentment, anxiety and anger, we can have clear thinking and access to solutions. By caring for ourselves as we would someone we deeply loved, we are investing into our happiness and well-being. The Moon is also forming a trine to Uranus - which has recently turned retrograde, and ideas need action steps, to put them into motion and reality. It is safe for us to take action upon our ideas and intuition. The New Moon is urging us to feel confident that all of the support that we need will come as we take that first step into the new. The ego may try to get us to procrastinate, demanding that we have a perfect plan before going forward. Rather than getting stuck in a perfectionistic attitude, try to stay curious, aware and open. Common sense may be important, but so is an open mind. Being open-minded is not the same as being naive. Open-mindedness is about our openness to growth and untapped potential. It's about being adaptable, without compromising what's most important. It's about believing that spirit always knows what we need and is guiding us to where we are meant to go next.